Oops, I wrote it, but forgot to click "publish!" Here's what's on the design wall this week. 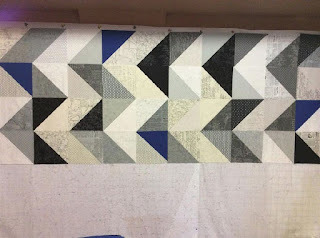 The pattern is "Chevron News" by Brigitte Heitland of Zen Chic for Moda. The original pattern calls for "Citrine" -- bright yellow -- but since I'm making it for an Air Force Academy graduate, I decided to use royal blue as the accent color. There's a bit of a story behind this one. While I was in Texas last summer, I ordered a half-yard bundle of Zen Chic's "Paper" from Fat Quarter shop. I didn't have a plan for it, I just liked it. And it's OK to buy it just because you think it's pretty (thus saith the Elder Son. Smart guy, huh?(. 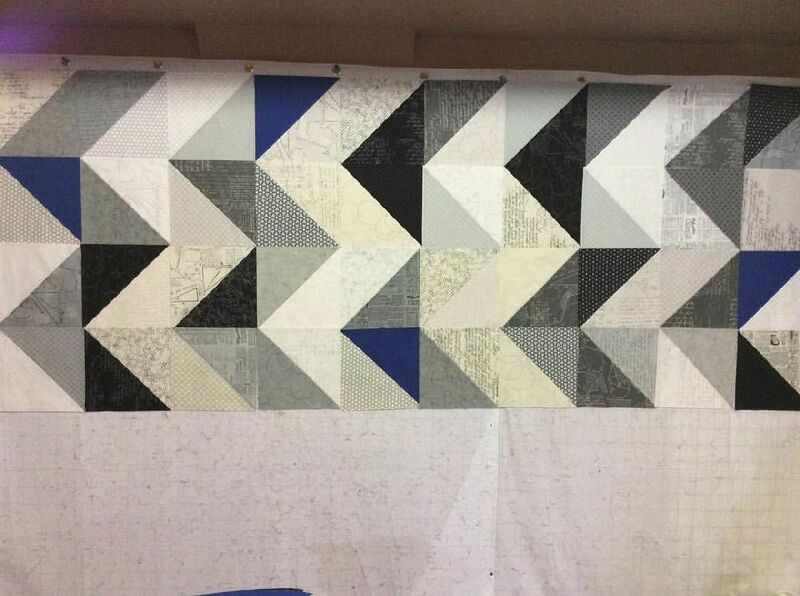 When May 1 rolled around and I realized I had one month to finish Blake's graduation quilt -- fast pattern to the rescue! First, I had to buy assorted yardage of "Ink" for the dark HSTs. 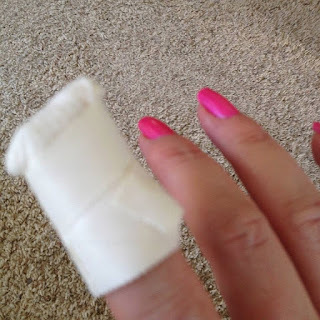 Ruth's Stitchery to the rescue! I cut the required 10" squares. stitched those puppies together on my 1500 stitchesperinch Juki (her name is Zippy) and started to trim. You know, the funny thing is, it didn't start to bleed immediately. When I realized I had caught the edge of my finger with the rotary cutter, I held it up and said, "Damn, that's going to hurt." Can you tell I was cutting with my left hand? Thanks to Barb Shie, I can cut with either hand. Lucky for me, the cut wasn't too deep. So I finished up the quilt yesterday, and it's going to Denise to long-arm tomorrow. And it's still more than two weeks until graduation! The moral of the story: Don't watch sad movies while trimming blocks! I am making this same quilt for my nephew for graduation. Since he is an engineering student I found more equation fabrics to include in his quilt. Looking forward to seeing your finished product. Watch out for your fingers. Somehow rotary cutters seem attracted to them. I have also been cut with a rotary cutter and agree - I see it happen, but no pain at that point! Then the bleeding starts and the stinging.